The fact that a character has received a code point in the Unicode Standard does not mean that it will be part of standard fonts. This is a decision to be made by the font producers. For the time being, many of the more unusual Nordic characters are only part of a few specialised fonts. See Appendix B for links to available fonts, some of which can be downloaded for free. The MUFI character recommendation and the Menota entity list are compatible with the Unicode Standard v. 8.0, published 17 June 2015. Note that the closing of the !ENTITY declaration should be at the end of the list of additional entities, i.e. the ]> characters. The basic characters a-z / A-Z in the Latin alphabet can be encoded in virtually any electronic system and transferred from one system to another without loss of information. Any other characters used to cause problems, even well established ones such as Modern Scandinavian “æ”, “ø” and “å”. In v. 1 of The Menota handbook we therefore recommended that all characters outside a-z / A-Z should be encoded as entities, i.e. given an appropriate description and placed between the delimiters “&” and “;”. In the last years, however, all major operating systems have implemented full Unicode support and a growing number of applications, including most web browsers, also support Unicode. We therefore believe that encoders should take full advantage of the Unicode Standard, as recommended in ch. 2.2.2 above. As of version 2.0, the character encoding recommended in The Menota handbook has been synchronised with the recommendations by the Medieval Unicode Font Initiative. The character recommendations by MUFI contain more than 1,300 characters in the Latin alphabet of potential use for the encoding of Medieval Nordic texts. 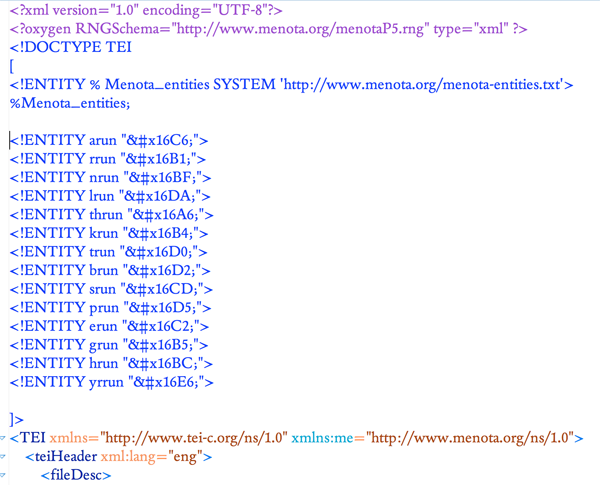 As a consequence of the synchronisation, the list of entities which is part of the Menota scheme is identical to the one by MUFI. In other words, if a character is encoded with a code point or an entity in the MUFI character recommendation, it will be a valid character encoding also in a Menota text. For more information on this synchronisation, please refer to Appendix A. (1) Basic Latin (a-z / A-Z). These characters can be encoded as they are, without resorting to entities. Note, however, that a few characters in Basic Latin are used for specific purposes in XML encoding, so if these characters are going to be encoded as such, only entities will do. These characters are the ampersand, “&”, which must be encoded as “&amp;”; the less-than sign, “<”, which must be encoded as “&lt;” and the greater-than sign, “>”, which must be encoded as “&gt;”. (2) All characters in the Unicode Standard outside Basic Latin. All of these characters can be encoded directly with their Unicode codepoints, e.g. using the code points listed in the MUFI character recommendation. MUFI compliant fonts probably contain all characters that are needed. However, as explained in ch. 2.2 above, one may refer to all characters outside Basic Latin with entities, and one may mix Unicode encoding and encoding with entities in the same document. (3) Characters in the Private Use Area. A number of characters in Medieval Nordic manuscripts are not part of the Unicode Standard, even if a substantial number of central characters was proposed for Unicode and became part of the standard as of v. 5.1 (April 2008). Characters in the Private Use Area are coordinated by MUFI, and as explained above, Menota synchronises its list of characters with the one by MUFI. Fig. 5.1. Text example from Niðrstigningar saga in AM 233a fol, 28v, l. 1-2 (cf. ch. 3.2 above). ok &aolig;llum helgum hans at leida þa i paradiſum hína fornu. If the “ao” ligature had been encoded with the earlier code point EF93, this text would no longer have been displayed correctly (unless an older font had been used). If it had been encoded with the entity “&aolig;”, the display would be correct. The characters a-z / A-Z are seen as base line characters, i.e. characters occupying a separate position on the base line of a primary source (typically a manuscript) and transcribed one by one in the order they stand. In addition to the characters a-z / A-Z there are a number of ligatures, i.e. combination of two (or in principle more) characters making up a new base line character, such as “æ”. There are also a number of variant base characters, e.g. a round form of “r” (r rotunda), or a tall form of “s”, and there is even a whole set of small capitals to be reckoned with, especially in Old Icelandic script. Furthermore, the base line characters can be modified by a number of diacritics (accents, dots, hooks, strokes etc. ), so that the theoretical number of combinations for any character is very high. 3. Modification of a base line character touching the base character outside its x-height. As explained in ch. 5.2.2 above, this character can be encoded and described in two equivalent ways. In general, we believe that the number of variants should be minimised, whether of base characters or of diacritics. There is, for example, only one base line character “a”, although this letter may have various forms in the manuscripts, i.e. “single-storeyed” (with a neck) or “double-storeyed” (closed without a neck). We regard this type of variation as paleographical, and suggest that it is not encoded, but that it is described elsewhere, e.g. in the TEI header or in the front matter of the electronic edition. Alternatively, this kind of variation can be recorded on a paleographical level, <me:pal> , in addition to the <me:facs> level. The <me:pal> element is included in the Menota schema. We would like to stress that the characters in this chapter should not be taken as an instruction of minimal and necessary distinctions to be made by the transcriber. We have defined two types of “s”, a low (or round) one and a long one. This does not mean that the transcriber should use both characters in the encoding of whichever manuscript exhibiting them, only that if s/he wishes to make the distinction, we suggest how that can be done. Glyphs are the typical shape of a character. In this chapter, they are displayed in the font Andron by Andreas Stötzner (Leipzig). The regular version of this font can be downloaded from the MUFI font page. All characters outside the range a-z / A-Z are referred to with entity names placed within the delimiters “&” and “;”. We recommend that entities as far as possible conform to the standard ISO entity sets. However, the ISO set only covers a minor selection of the entites we believe are necessary for the full transcription of medieval Nordic manuscripts. This chapter thus discusses a number of additional characters with accompanying entities. We have tried to adhere to the inventory and syntax of ISO entities. For a summary of the entity naming scheme, please refer to ch. A.9 below. We have supplied code points from Unicode 8.0 for all characters (or parts of characters) defined in this standard. For the remaining characters we have defined code points in the Private Use Area. These are shown in bold type (and dark blue). The MUFI character recommendation contains Unicode values for a large selection of characters. Each character is described according to the naming scheme in Unicode, as explained above. We also suggest descriptive names for those characters not included in the Unicode standard. These characters are described in ISO 646 and are found on the keyboard of virtually any Western computer. They are identical to US ASCII positions 32-126 and are often referred to as Basic Latin. Characters in Basic Latin are encoded without use of entity references. Unicode 8.0 defines these characters as belonging to the range Basic Latin (positions 0020-007E). Note that the distinction between minuscule (lowercase) and majuscule (uppercase) characters is an inherent trait of the coding scheme; it is not shown by entity names such as “&amin;” for “a” and “&amaj;” for “A”. However, when it comes to the question of small capitals and enlarged minuscules it will be necessary to introduce entity names, as discussed in ch. A.6 and ch. A.5.4 below. Unicode 8.0 defines “þ” (thorn) and “ð” (eth) in the range Latin-1 Supplement. In addition to “þ” and “ð”, Modern Icelandic has seven vowels with diacritical marks, “á”, “é”, “í”, “ó”, “ú”, “ý” and “ö”, and one ligature, “æ”. These will be treated as modified characters and discussed below. Small capitals have the same form as majuscules (capital letters), but are usually drawn with the same height as a minuscule (small letter) such as “x”. Small capitals were used in Old Icelandic to denote geminates, i.e. long consonants, or they were used ornamentally (often so in Old Norwegian). The letters “B”, “D”, “G”, “M”, “N”, “R”, “S” and “T” were often used as geminates, while these and other letters might also be used as ornaments in the whole or in parts of highlighted words. Some of the small capitals, e.g. “O” and “C”, are difficult to distinguish from minuscule letters. We suggest that small capitals receive the suffix “scap” (for “small capital”) in the entity name. Unicode 8.0 has defined nine small capitals in the IPA Extensions range, sc. “B”, “G”, “H”, “I”, “L”, “N”, “”, “R” and “Y”, and sixteen in the Phonetic Extensions range, sc. “A”, “Æ”, “C”, “D”, “ETH”, “E”, “J”, “K”, “M”, “O”, “P”, “T”, “U”, “V”, “W” and “Z”. For the remaining small capitals we will have to resort to the Private Use Area, i.e. “F”, “Q”, “S”, “THORN” and “X”. Cf. Appendix A for reference to the complete overview in the MUFI character recommendation. We recommend that small capitals are transcribed as such, irrespective of whether they are being used for geminates or for ornamental purposes. Cf. ch. 6.3.10. Some scholars believe that enlarged minuscules should be transcribed as separate characters. The traditional view is to interpret these characters as variants of capitals (majuscules) and encode them as such. There are comparatively few characters which appear as enlarged minuscules, and it is sometimes difficult to decide whether a minuscule character is enlarged or not. We recommend that enlarged minuscules are transcribed as capitals in cases where it seems obvious that they function as a capital and as ordinary minuscules elsewhere. If, however, the transcriber wishes to make a distinction between capitals and enlarged minuscules, we recommend the suffix “enl” (for “enlarged”) in the entity name. Unicode 8.0 does not recognise enlarged minuscules as separate characters. A small selection of enlarged minuscules has been included in the Private Use Area, e.g. “a” and “e”. Cf. Appendix A for reference to the complete overview in the MUFI character recommendation. A few characters have distinct Insular forms, e.g. “r”, “f” and “v”. These characters are sometimes transcribed as separate characters, as opposed to their Carolingian counterparts. We suggest using the suffix “ins” (for “Insular”). Unicode 5.0 does not recognise Insular characters as separate characters, with the exceptions of “g” and “w” (wynn) in Latin Extended-B. A few Insular characters have been included in the Private Use Area, e.g. “f” and “v”. Insular “g” is to our knowledge not found in medieval Nordic manuscripts. A few characters may appear with a typical Uncial form, especially “e” and “m”. These characters are sometimes transcribed as separate characters, as is the case with Insular letter forms. We suggest using the suffix “unc” in the entity name. Note that some Uncial forms may also be characterised as round, cf. A.6.8 below. Unicode 5.0 does not recognise Uncial characters as separate characters. A small selection of Uncial characters has been included in the Private Use Area, e.g. “e”, “k” and “m”. Cf. Appendix A for reference to the complete overview in the MUFI character recommendation. Runes are normally not used in conjunction with the Latin alphabet, but when they appear in isolated instances – e.g. in The third grammatical treatise – they should be transcribed with appropriate entity names. We suggest using the suffix “Medrun” (for “Medieval runes”). Unicode 5.0 has defined a selection of 81 runes from the Older and Younger Futhark in the Runic range. Note that the descriptive names given below are those chosen by Unicode. Note that the runes “m” and “f” may also be used as abbreviation signs, cf. ch. 6.3.6-7. Some base line characters have commonly recognised variants. In general, we recommend that variants, e.g. “single storeyed a” and “two storeyd a”, are not transcribed as separate entities. In many cases it is difficult to decide which of the variants to choose from. However, there are a few variants which are very distinctive and often recognised in transcriptions. This applies to “tall s” and “round r”, for which we suggest the suffixes “tall” and “rot” (for “rotunda”) respectively. Unicode 5.0 recognises “long s” as part of the Latin Extended-A range, but “round r” is not recognised. This has been allocated to code point F20E in the Private Use Area. Ligatures are two base line characters which are joined so that they form a new, composite base line character. Some consist of two identical characters, e.g. “a+a”, others of different characters, e.g. “a+v”. Ligatures may be used to denote length, “a+a”, diphtong, “a+v”, or a distinct vowel quality, often mutation (Umlaut), “a+v”. A well known example is the ligature “æ”, formed of “a” and “e”, encoded as “&aelig;” in ISO 8879. In analogy with this usage we suggest that ligatures receive the suffix “lig” following those base line characters which make up the ligature. Unicode 5.0 does not recognise ligatures in the Latin alphabet as base characters. The only exceptions are “æ”, “” and “ij” (not used in Nordic). For “æ” see the Unicode range Latin-1 Supplement, and for “” Latin Extended-A. Other ligatures must be defined in the Private Use Area. Cf. Appendix A for reference to the complete overview in the MUFI character recommendation. We recommend that only ligatures with a distinctive value should be given an entity name of their own, i.e. only those ligatures which possibly reflect a phonological opposition. We regard ligatures which are motivated by graphic economy as sporadic ligatures and recommend that they should be transcribed as separate characters. To this group belong ligatures such as “b+b”, “p+p” etc. Especially in late Gothic script there are many examples of junctures (fusion of bows) which can be interpreted as ligatures, but which in our opinion should be encoded as individual characters. If a transcriber wishes to transcribe sporadic ligatures as ligatures, we suggest using the element <seg> with the attribute @type="ligature", e.g. Modified characters are base line characters with diacritical marks. They are described according to rule (4) in ch. 2.2.1. If there is more than one modification, they are listed in the sequence specified in rule (6). The character “ø” is still being used in Modern Danish and Norwegian, and is encoded as “&oslash;” in ISO 8879. In some manuscripts the stroke may be horizontal and in others diagonal, but in general we do not believe it is relevant to distinguish between variant strokes. Unicode 5.0 has defined “ø” as part of the Latin-1 Supplement range. A few vowels, especially “o” and “e”, may have a hook. The latter combination, “e caudata”, is common in Latin manuscripts, in which the letter form alternates with the ligature “æ”. The hook may be placed below or above the base line character, facing either to the right or to the left. Of these combinations, the distinction between left- and right-turning hooks may simply be accidental. The two “canonical” forms are the hook below to the right and the hook above to the left. We recommend using “ogon” for the hook below and “curl” for the hook above (since “hook” possibly is more ambiguous). Unicode 5.0 recognises “a” and “e” with hooks in the range Latin Extended-A, and “o” with hook in Latin Extended-B. In Unicode, the hook is referred to as “ogonek”, a Polish word for “little tail”. The ogonek is also defined as a combining character, 0328 in the range Combining Diacritical Marks. The hook above may be identified with the tone mark in Vietnamese, 0309 in the range Combining Diacritical Marks. This mark, however, has a slightly different form (comparable to the recognised distinction between the cedilla and the ogonek). For this reason, we suggest using a separate code point in the Private Use Area, F1C4. Loops are in most cases reduced forms of “a” or “o” and can thus be interpreted as ligatures. Unicode 5.0 does not recognise loops, either as separate characters or as combining diacritical marks. Single and double acute accents are quite common in Nordic script. A single acute accent is encoded with the suffix “acute” in ISO 8879, e.g. “&aacute;”, while double acute is encoded with the suffix “dblac”. This usage is adopted here. Unicode 5.0 defines “a”, “e”, “i”, “o”, “u” and “y” with acute accents in the Latin-1 Supplement range, and “æ” and “ø” in the Latin Extended-B range. The vowels “o” and “u” are defined with double acute accents in the Latin Extended-A range. Other accented characters must be encoded as a combination of a base line character and 0301 COMBINING ACUTE ACCENT or 030B COMBINING DOUBLE ACUTE ACCENT from the range Combining Diacritical Marks. As explained in ch. 2.2 this “decomposed” encoding can also be used for the precomposed vowels mentioned above. Double acute accent sometimes resembles a circumflex, “^”, cf. Seip 1954, p. 145. Grave accent sporadically appears in comparatively young Icelandic manuscripts, especially “è”, while double grave accent to our knowledge is not found in medieval Nordic script at all. If necessary, we suggest using the suffix “grave”, e.g. “&egrave;”, for the single grave accent. Single and double dots are quite common in Old Norse script. Single dots appear over vowels as well as consonants, double dots usually only above vowels. In ISO 8879 the suffixes “dot” and “uml” (for “Umlaut”) refer to single and double dots respectively. This usage is adopted here (although double dots in no are way restricted to the original mutated vowels). Unicode 5.0 defines a number of consonants with a single dot above, sc. “b”, “d”, “f”, “h”, “m”, “n”, “p”, “r”, “s”, “t”, “w”, “x” and “long s”, and also the vowel “y”, all in the Latin Extended Additional range. Other dotted characters must be encoded as a combination of a base line character and 0307 COMBINING DOT ABOVE or 0308 COMBINING DIAERESIS from the range Combining Diacritical Marks. As is the case with accents, “decomposed” encoding can also be used for the precomposed characters mentioned here. Single dots above can be seen as a type of abbreviation, since the dot usually signifies gemination of the characters it is placed above. Cf. ch. 6.4.8. The discussion in ch. A.3-5.5 has shown that entity names are built up in a strict sequence with a limited number of possible values. The syntax and inventory is shown in the table below. Note that not all slots need to be filled in; in most cases only one or two slots are used. Please note that if there is a conflict between the standard ISO entities and the syntax suggested here, ISO entites should be preferred. The punctuation marks in medieval Nordic script are basically the same as in the Modern European languages, but their use was less consistent, and many manuscripts only used a single mark, the dot. There was also some special types of punctuation marks. Unicode 5.0 has the marks in the table below in the ranges Basic Latin and Latin-1 Supplement, with the exception of the inverted semicolon, the pause mark and the triangular dots. First published 9 June 2016. Last updated 5 December 2018. Webmaster.